The location is perfect for walking to everything from The Bean and The Art Institute of Chicago to Skydeck in Willis Tower, Shedd Aquarium and The Field Museum. We even walked home from The Jazz Showcase at 10 pm and were perfectly safe. Many theaters, great restaurants, and shopping within blocks. We were only steps away from the river, Lake Michigan, Chicago style pizza and hot dogs. If you want to explore further than a couple miles from the hotel, the subway is nearby. We wanted to ride the L Train (just for kicks) but ran out of time. Room with a city view that we were guaranteed, did not happen. They were out of these rooms, despite my booking a month out and being told they would be sure to accommodate. It was cute and unique. It was nice to have the happy hour with wine and the breakfast was great. Very nice, easy to use, friendly, great location, comfy bed. The staff was extremely friendly. The room was clean and modern. Check in was quick and easy. The windows seemed paper thin and any outside noise sounded like it was inside our room. Our room overlooked an alley full of dumpsters that were filled and emptied at all hours. Perhaps a street-view would have been quieter. Great expierience we would stay there again!!!!!!!! There were a lot of things about this, whether through orbitz or Kinzie that were misleading and not to satisfaction. We paid extra for a city view room, which apparently just means being able to look right at the building next to you and nothing more. The bathroom condition was convening, specifically the shower. The sheets were dirty and there were giant clumps of hair in the bed. For all the money and extra charges, the experience was subpar at best. This was the most beautiful hotel with incredible views, right downtown Chicago. The staff was friendly and helpful, and I thoroughly enjoyed every aspect of my stay. I only wish I would've been able to stay longer! Very nice hotel! Bed was comfortable, staff was pleasant and helpful, and room was clean. Breakfast was basic cereal, pastries, and beverages. Harry Carry's is directly across the street and Pub City is next door, both were excellent! I would highly recommend this hotel! 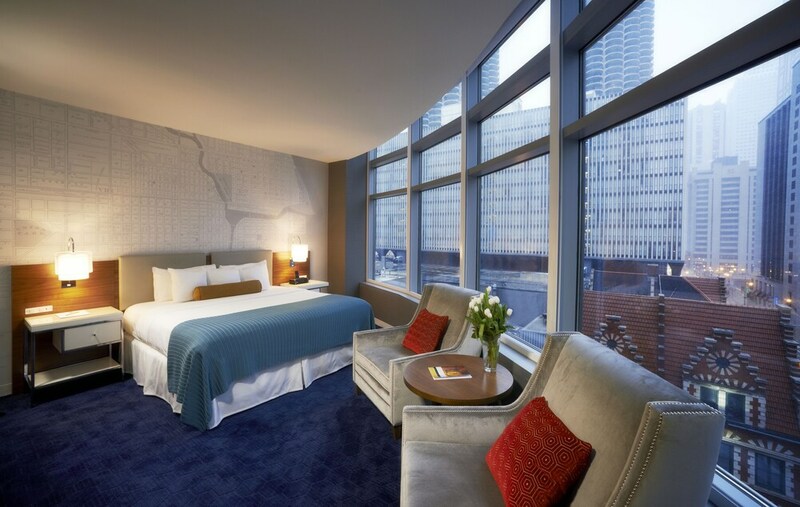 Located in River North, Kinzie Hotel is next to popular attractions like State Street and House of Blues Chicago. This 215-room, 4-star hotel welcomes guests with free breakfast, a fitness center, and a 24-hour business center. Free continental breakfast is included with your stay. Explore the hotel and meet new friends over drinks at the bar/lounge, or enjoy a bite to eat at the onsite restaurant. Order from room service to satisfy your hunger without leaving your room, or meet other guests at the free daily manager's reception. Guests can expect to find WiFi and 42-inch a flat-screen TV with digital channels. Beds sport premium bedding and the bathroom offers a hair dryer and designer toiletries. Other standard amenities include an iPod dock, a refrigerator, and a minibar. Renovated in 2014, Kinzie Hotel offers a fitness center, free WiFi in public areas, and conference space. Valet parking is available for USD 66.00 per day, and there's also limo/town car service. The 24-hour front desk has multilingual staff ready to assist with luggage storage, concierge services, and securing valuables. Additional amenities include a 24-hour business center, express check-in, and express check-out. We appreciate your 5/5 review. We hope to see you again soon! Thank you for your rating. We hope that you will return to the Kinzie Hotel. We appreciate you taking the time to leave such a detailed review! I am delighted to see that our location was ideal for your travels. Thank you for your great feedback and amazing suggestions about enhancing our offerings. We appreciate the review. We would like to apologise that you were unable to receive a room with a view. We always wish to do our best for the great views for all of our guests and hope that you can give us a second chance. We are so glad you enjoyed some of the amenities our property had to offer. We hope this will bring you back to the Kinzie if ever in the Windy City again. We love your amazing review and comments about the Kinzie Hotel and glad that you had a comfy and friendly stay. Thank you so much. Recreation features at Kinzie Hotel include a fitness center.